Through the use of the Tarot, the card magic that is used via her main magic-- Selina learns how to harness the same magic that governs the cards into new forms. 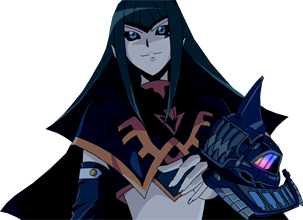 She takes them on into herself to transform her abilities via conjuring garments and weapons of the arcana known as "Arcana Armaments." 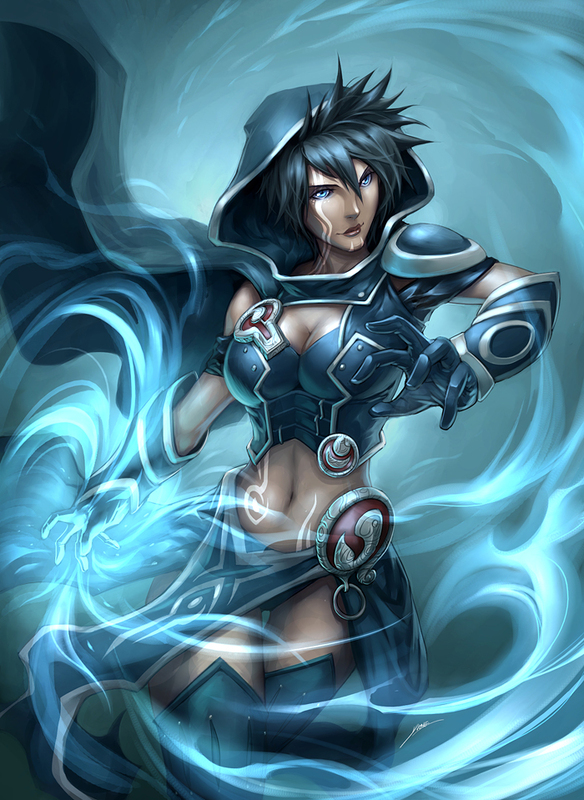 The magic allows her to conjure weapons and items tied to the individual powers of the Arcana. Though a seemingly fickled and chaotic magic, the martial power the magic alone holds is able to rival the best of Requipt users. Her training among the Umbra Witches, made her capable to wield both magic and martial power as many of her clan used 'demon arms' to fight. The weapons conjured reflect the theme of the 21 Major Arcana and minor arcana cards. However, these are not limited to only to weapons, as she can also summon powerful Eidolons -- ancient spirits tied to the essence of the arcana as well. They appear to be a mix of angels, demons or terrestrial spirits but bound to the nature that the arcana represent-- without the deadly consequences of a blood pact or trading one's soul as many of the Umbra Witches or Lumen Sages used. The method for changing and summoning revolves around the Tarot Cards she carries, partly due to the association with The Tarot of the Morei. The cards swirl around her to change her appearance, or to conjure the gates for the Eidolons to emerge through. Can have up to 3 Requip spells active at once. Note: Abilities in orange indicate abilities added via a physical purchase of items along with any rank or detailed version applied to each one. A fiery red cloak with orange and golden embroidery, some in arcane runes to represent a strong magical encantment. It is made of "embercloth" often used in alchemy for easy use of creating a spark or ignition. The robe is infused with the power of fire, allowing one to wear it to resist and wield it with ease. Effect: While worn, the user has a 40% resistance to fire magic and fire-related damage. Environmental or natural fire does no damage to the wearer. When calculating fire damage upon the user, the armor will take no damage when involved with fire magic. Damage: 40 HP/ 40 HP + Enemy's Fire Damage. Effect: When in the presence of fire, the wearer performs an alluring and beatiful dance as a means to cast. 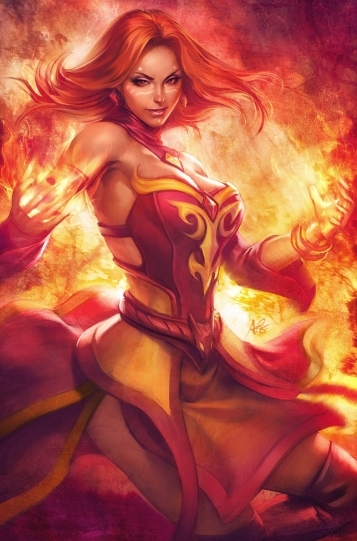 Fire churns around her, and in a final performance, releases a tornando of fire all around her, burning all in her vacinity with a powerful blaze. This spell, however, can be used to reflect enemy fire spells back at their opponents as well, using their own magic power against them. They take their own enemy's fire and direct it back at them. A stylish outfit of violet and watery textures. White and violet leathers and clothes form a classy but somewhat revealing attire. Feathery accessories hang off, but embroided by a watery pattern on the elegant blue design. The outfit is said to be enchanted to repel and endure frigid colds and water magic. Effect: While worn, the user has a 40% resistance to water magic. While wearing this vestment, the user can swim faster in water like a mermaid and also maintain normal body temperature in figid colds and breathe under water. Effect: While worn, the user has a 40% resistance to ice magic. While wearing this vestment, the user can survive in frigid colds, unburdoned by freezing temperatures and cannot be frozen. An classy, yet earthy looking outfit designed to embody the will of nature and the earth. Though it shows more skin than intended, its as durable as any form of armor and gives a natural resistance to earthen magic. Effect: Channels the earth into the body of the wearer. Reduce physical damage by 25% and increase physical damage done via weapons or melee by 25%. Despite the flimsy and alluring look of this costume, it can form a powerful armor to fend off the worst of foes. A special cloak and outfit designed made of 'mooncloth' known for its silk-like texture and reflective qualities. In truth, they are the foundations of all 'invisibility cloaks' made in Earthland. The special gear is made to harness the moon's illusionary powers, giving the user unparalleled illusionary abilities to their advantage. Most worn by thieves or spies for stealth operations. Effect: While worn, at the wearer's command and dawning of the cloak's hood-- the wearer becomes invisible, able to blend into the background and vanish from sight completely. Though still solid and able to touch and be touched, they cannot be perceived by the naked eye. After its duration, the cloak must recharge for 1 post to be active. Effect: When in combat, the wearer of the cloak can activate two of its abilities at once. One-- to create an identical version of itself in its own appearance. The second is to slip away in an invisible state. The illusion has some minor mass in it-- as durable as the durability of the armor itself, but will behave similarly to the original's will. However, this is a substitution method for while the illusion can fight, the original now invisible, can sneak into the right spot or escape harm, while using the illusion as a diversion. This spell's invisibility lasts as long as "Lunar Shroud" and share its same cooldown to use simultaneously. The technique is similar to how a lizard would lose its own tail to escape harm. Effect: When riding Chariot, rider and passangers are offered a 55% raise in the user's speed. The magicycle is capable of moving as a veichle at high speeds, easily overcoming certain obstacles and at its speed, able to ride along certain vertical or upside down surfaces. Its speed also is reflected by the will and speed of the riders as well. Effect: While on the Chariot Magicycle, the user can naturally use the large magicycle to ram and slam through enemies or target within their way. This reckless form of impacts can be dangerous but in a stop-gap means can cause some severe damage to enemies around them. Best get out of their way. 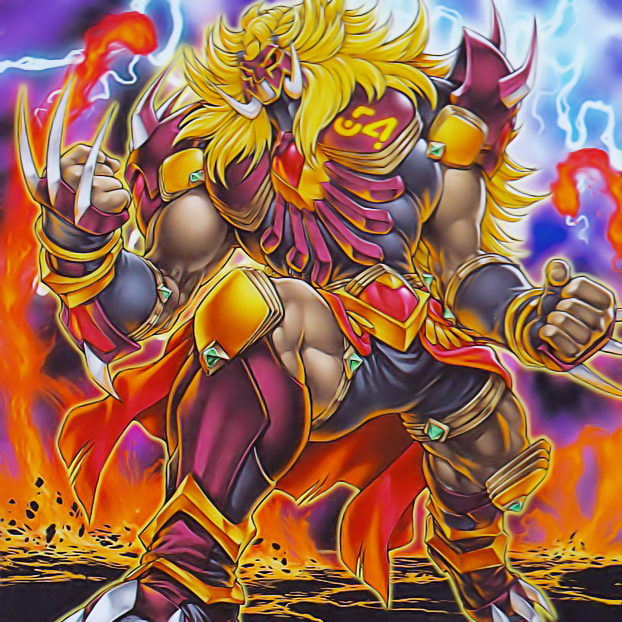 VIII - The Strength "Lionheart"
An eidolon spirit embodying the nature of the Strength Arcana. Like the lion in the picture, Selina has tamed the mighty strength of this power and now serves her faithfully. It is a spirit that is part man, part lion-- easily towering over most like a giant. It is dawned in crimson red and yellow armor with the "VIII" placed on its breastplate. Representing strength, courage, inner-strength and vital energy, it is strong in body and in will. It acts as a loyal guardian to its summoner, using his massive size and brute strength to fight for its master. Melee damage: 12 HP per hit. Effect: Releases the restraints of the body on itself, allowing the eidolon to grow in size and a fiery aura surrounds it. A fiery aura surrounds it, which increases its physical strength by 30% and reduce damage taken by 25%. The rush of power makes him a more stalward guardian and bodyguard as he will fight to the death for his master. Effect: Lionheart launches himself high in the air and slams down on a target area. The resulting impact and added 'oof' of magic, causes a violent explosion within the earth around him. Both fire and earth are torn asunder, along with all enemies in the immediate vacinity. This violent shock also causes the enemies to stagger from the concussive force. A pair of silver daggers elegantly crafted by the elves. A curved form with goes from handle and the blades themselves. At night, parts glow with an eerie light. They were said to be forged upon the peaks of Galuna island, which absorbed light from the moon drip to utalize the moonlight's power. Effect: The nature of these daggers are deceptive by nature. When held by a mage and in the presence of nighttime or darkness, the eerie glow is actually its activation of its lunar magic. The blades are cloaked by an illusion that extends their reach-- creating blades of moonlight that are literally invisible to the naked eye. They can only be detected via wizards with higher than spell's rank of sensory skill or able to see illusion magic. The mirage blade can cleave at distances, making an enemy think they are safe but in reality they are not. They are activated merely at the caster's will but will be active whenever held. However, this ability will not work when exposed to sunlight-- as the mirage magic becomes visible as a shimmer of moonlight around the blades. Effect: The moonlight enchantment is soon used to fully materialized in the form of a slash around the caster. The blade's light brightenes to fully visible levels as blades of moonlight slash out in crescent waves around the battlefield. The spell is magical in nature, but is capable of slicing an ogre in half. The slash is a full 360-degree attack, leaving nothing untouched by her blades. An odd design for the designated show of 'death'. This is a robe potrayed of ebrodded dark green, black and violet colors. It is loosely flowing robes tied by golden accessories with gothic, witch-like designs. Golden accessories link to her body to hold the robe in place, showing to be more elegant than the grim name suggested by the spell's title. 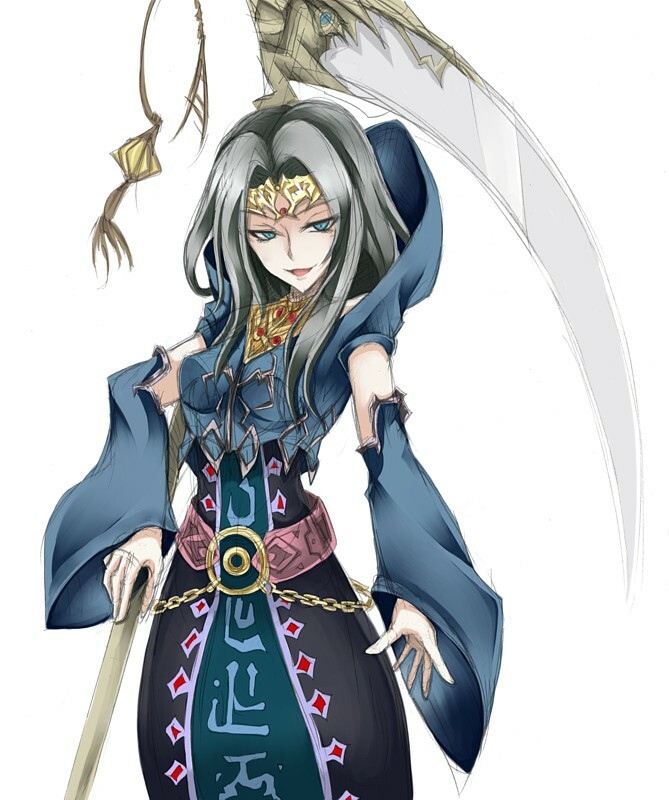 It is most often a complete set when the scythe weapon is included. The robes are said to empower the user with shadow and darkness magic for a variety of uses. Effect: Elusive as the night, one cannot catch a shadow. While wearing this outfit, the user may employ the use of darkness magic to actually make their body intangible. Physical objects and melee/weapon attacks pass right through them. This is an extremely powerful defensive ability as she can easily slip past up to 2 C+ spells before magic wears off and needs to be recasted. This acts as both a formidable defense, and allows her the ability to slip through walls and solid objects. Requires a 1 post cooldown after use since the body cannot be intangible forever. Cannot also iniciate physical attacks while in this form. Effect: Using the cloak's power over darkness, the wearer can literally transform their cloak into a deep black and their body along with it, becoming an eitherial shadow. Their speed is increased by 85% and is immune to all form of darkness magic of C+ rank and lower in this state as the shadows only increase their speed and mobility. This allows them to launch attacks from the safety of shadows without risk of being hit. This is however have one critical weakness that will force the user to return to their normal state and eject them from the shadows. Inspired by the arts practiced by the Umbra Witches' 'gun arts', the power of the Tower Arcana has taken the form of a series of black and violet stylized (Mauser C96 "Broom handle") pistols that fire magic bullets per shot. Each one is embedded with a precious gem and the "XVI - The Tower" is inscribed on each pistol. The pair is held by hand-- but also a pair can be added to the woman's heels via magic for a stylish, acrobatic shot. A fighting style of the Umbra Witches and used to craft the Tower arcana's weapon for its destructive nature. Ammo is not an issue as it automatically refills after a time due to its magic. Effect: Though the guns normally fire its bullets in weapon damage-- at command, Selina focuses magic into each shot to fire several rounds from all her guns, both in her hands and the ones in her heels (when she sees fit). It can target multiple enemies and deliver 'chaos' damage-- damage of a non-elemental nature. More so-- these magically charged bullets are so potent they can bypass and pierce enemy defense magics with ease. 2) Please give all your ReQuip type spells and actual duration. Requips have to have a duration just like their active abilities need a duration. Also, please make sure all your spells have appropriate ranges and speeds. Able to resist fire damage and unharmed by fire itself. Immune to Burn effects caused by fire-related spells. Cannot stop unique effects from fire enemies, outside of normal spectrum. Treats as normal armor against other forms of damage. Manipulates natural, surrounding fire to create a powerful explosive blaze for offensive purposes. Can adapt to slayer's fires to use their magic against them. Excellent for fighting enemy slayers. Can only absorb and reflect the fires of equal rank to this spell. Cannot reflect or absorb spells of mixed elemental properties. Able to resist earth-related damage and unharmed by rocks, soil and trees itself. Cannot be stunned by earth attacks. Cannot stop unique effects from earth enemies, outside of normal spectrum. Not very helpful against ranged enemies. Able to vanish from sight and easily escape and infiltrate tight situations. Cannot be targeted by visual aim. Still detectable via physical contact and illusion ends if an attack is iniciated. Same cooldown required of 1 post. Still detectable via other senses such as smell or sound if user is not careful. Creates a realistic illusion with minor mass and fighting capability while allowing the original to escape. Illusion only has 90 HP of durability before it is destroyed via harm. Can only conduct D rank melee attacks. No magic. Offers a significant speed boost and mobility in rural environments. Requires a recharge period when duration ends. Must recast with MP to ride again. After use it vanishes-- similar to summon but can be recalled. 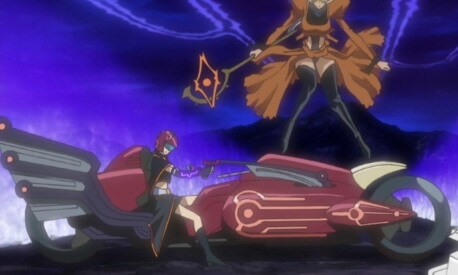 Uses Chariot's own speed to impact to others. Only accessable when Chariot's Chase is active. Cannot use damage when its cost isn't paid. Reckless form of damage if user is not careful. Lionheart will likely go into a berserk state on his enemies, not listening well to reason and becoming reckless. Both physical impact but fiery eruption of earth element. Classified as a mix of fire and earth. Unable to be consumed by fire slayers/earth slayers. Only works for those who can do both. Stun's enemies for 1 turn. Short Range via Burst and user must launch self in the air to do so. Deceptive reach of the blade for hand to hand combat. Passive reach while under environmental conditions. Enchantment only works in darkness, nighttime or exposed to moonlight. Detectable by those with the sensory of magic higher than Rank C.
Visible under sunlight to the naked eye. Blades of moonlight slash enemies at 360 degrees of magical damage. The damage is fast happens in split-second intervals. Enemy could evade via going over or under the cresent blades, but then vulnerable if mid-air. Cannot target enemies underground. 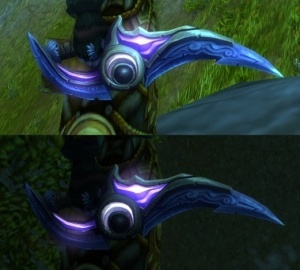 Moonlight blade can be consumed via light-slayers. A universal defense against physical attacks. Able to evade through terrain and sneak into buildings with ease. Immune to physical attacks or magic that launch physical attributed attacks. Cannot physically interact with enemies till enchantment is stopped. Can be harmed by magic that works on a 'spiritual' level. Ex: Magic that influences via the mind or targets a person's spiritual nature. Can not make others intangible-- only self. Able to swiftly move through shadows to move around and slip thorugh physical defenses. Is considered a shadow. Immune to darkness magic in this state. Extremely bright light will make the shadow move slower. Successful light magic will instantly reveal the wearer from their shadow state and inflict damage to them as such. Long-range and multi-target weapons capable of delivering powerful shots at multiple targets. Eatable by 'chaos slayer' ? Difficult to aim accurately if juggling melee and range at once, but not impossible. I removed the stuff regarding strengths and weaknesses. Regarding the other stuff-- that is where i am confused. THe rules do not state that Requip is any form of duration beyond the spells used within each piece of equipment. All the spell speeds are accurate last i check. But please confirm if that it is true regarding durations on requip cause that is a big deal there. I added durations to the requips. Im sorry for the delay and for the resistance. Effect: When in combat, the wearer of the cloak can activate two of its abilities at once. One-- to create an identical version of itself in its own appearance. The second is to slip away in an invisible state. The illusion has some minor mass in it-- as durable as the durability of the armor itself, but will behave similarly to the original's will. However, this is a substitution method for while the illusion can fight (If the illusion can fight I need you to specify the damage it deals), the original now invisible, can sneak into the right spot or escape harm, while using the illusion as a diversion. This spell's invisibility lasts as long as "Lunar Shroud" and share its same cooldown to use simultaneously. The technique is similar to how a lizard would lose its own tail to escape harm. Effect: When riding Chariot, rider and passangers are offered a 55% raise in the user's speed. The magicycle is capable of moving as a veichle at high speeds (what speed exactly ? ), easily overcoming certain obstacles and at its speed, able to ride along certain vertical or upside down surfaces. Its speed also is reflected by the will and speed of the riders as well. Effect: Releases the restraints of the body on itself, allowing the eidolon to grow in size and a fiery aura surrounds it. A fiery aura surrounds it, which increases its physical strength by 30% and reduce damage taken by 25% (What damage ? You will have to pick either physical or magical damage, otherwise this would come out at a buff total of 80%, which is too much for a C rank active ability). The rush of power makes him a more stalward guardian and bodyguard as he will fight to the death for his master.